Asus announced the Zenwatch 2 in September of 2015, so as we approach September of this year you might be expecting a successor for that device to be outed. And, it turns out, you'd be right. 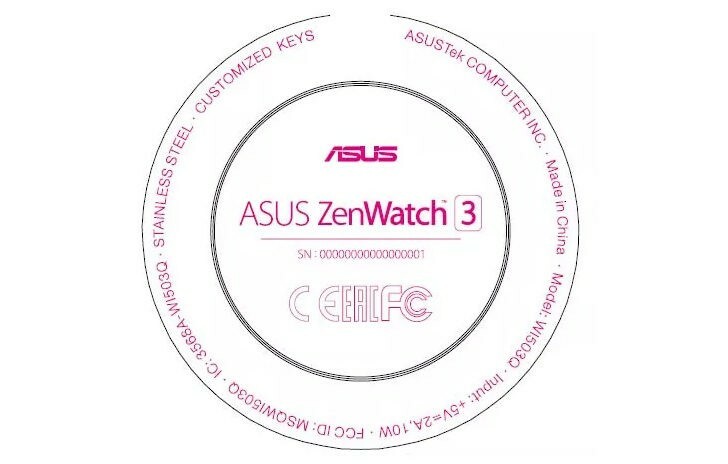 The FCC has certified the Asus Zenwatch 3, as the label portrayed below clearly indicates. Also obvious: the watch will be Asus' first one to come with a round shape, and thus a round screen. Hopefully it will also sport much smaller bezels than previous Zenwatches. FCC documents also reveal that the Zenwatch 3 will support Bluetooth 4.2, Wi-Fi 802.11n, and will have a stainless steel back. It will come with a 5V 2A charger. Like its predecessors, we expect it to run Android Wear. And since IFA is being held at the beginning of September, we assume that's where Asus will choose to make the Zenwatch 3 official. I ask "How?" to both of those comments. Made in China is a drawback.